> Exfoliating Face Wash – Glycolic Acid Facial Cleanser Scrub With Hyaluronic Acid and Vitamin C – Best Value - Huge 8.6 oz. SIMPLY THE BEST: Add DermaSafe’s Glycolic Acid Exfoliating Cleanser to your daily routine and give your skin the moisture and freshness it deserves. The formula contains ALOE VERA BASE + GLYCOLIC ACID + VITAMIN C + WITCH HAZEL which increases resistance and reduces permeability of blood capillaries, accelerates cell exchanges, and drains adipose tissues. NO BREAK OUT: With No Benzoyl Peroxide, No irritation, No redness and No peeling in this soothing and moisturizing cleansing gel is great for sensitive skin types and adds Lemon Peel Extract, Peppermint and Spiraea Ulmaira Extract to stimulate your skin and reduce sebum secretions by inhibiting the 5x-reductase activity, limits sebaceous excretion thanks to an astringent effect and prevents bacterial proliferation. Great for treatments for oily and/or acneic skin types. LONG LASTING BENEFITS. While removing dirt, excess oil, makeup and clearing dead skin and pores on the face and body this gentle wash works to effectively reduce wrinkles, age spots, dark spots, sun spots and other forms of discoloration while helping with acne, acne scars and premature aging while adding all the benefits of deep cleansing and supporting collagen production and leaving your skin feeling fresh, clean and moisturized. Loaded with antioxidants. MADE IN THE USA: All our products are made right here in the USA with an FDA approved facility following strict GMP guidelines. 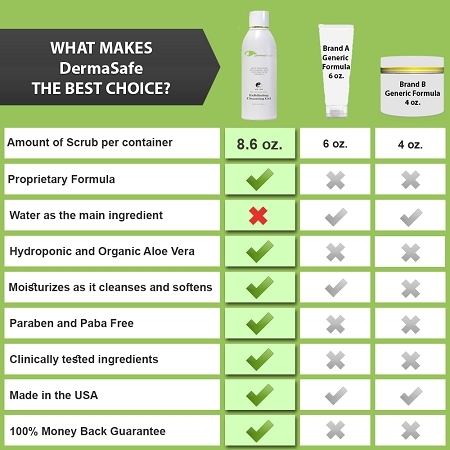 DermaSafe always uses Aloe Vera Base instead of water to give you the best value products. Of course our products are both Paraben and Cruelty Free. We stand behind our products 100% and are confident in our formula. If for any reason at all you're not happy, simply contact us for your money back. If you're not happy, neither are we! Order with confidence knowing that we've got you covered. FOR WOMEN AND MEN: With the perfect balance of essential ingredients, this cleanser works like a miracle for both men and women of all ages. We use only the highest quality and most effective ingredients in our products, which is why your skin will also receive antioxidant protection and support your skins health.